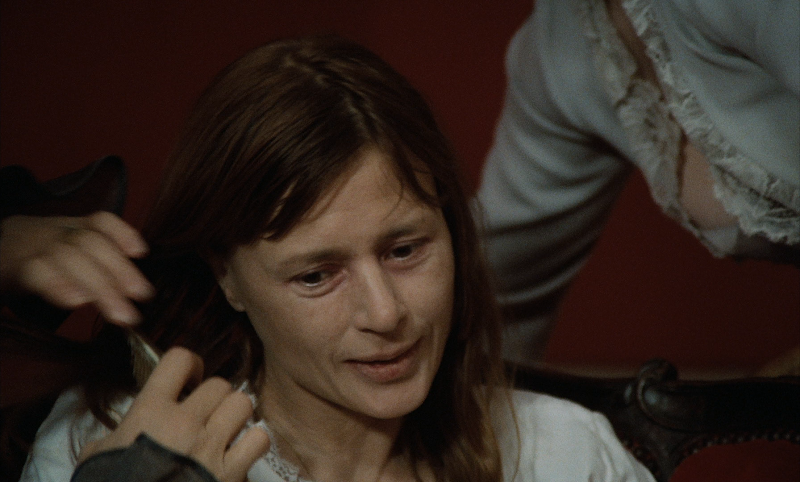 When I watch an Ingmar Bergman film, one of the things I'm most looking for is powerful emotion. I can appreciate the creative imagery and symbolism of, say, a knight playing chess with a mysterious hooded figure representing death. But my personal favorites, the ones I feel most compelled to own and revisit, are the deeply human, affecting ones. So, you know, I'm more of a Face To Face than Wild Strawberries guy, personally. And once that criteria's in place, probably the first film everybody's mind will jump to is Cries and Whispers. Update 11/20/18: With Criterion's brand new 30-disc boxed set of Ingmar Bergman blu-rays called Ingmar Bergman's Cinema., comes a brand new edition of Cries and Whispers. Yes, it's a whole new scan and all, not just a repress of their last blu in a new box. But is it worth replacing our 2015 blus? 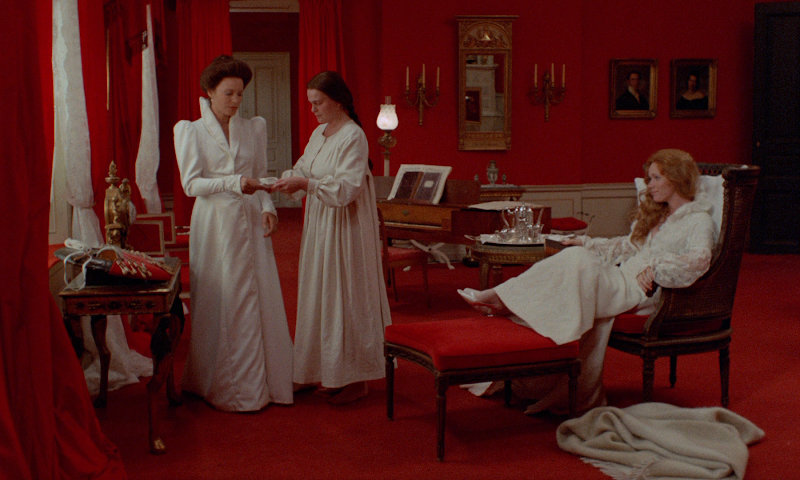 Modernized and reinterpreted by Woody Allen as Interiors, Bergman's original period piece is considerably darker, as here the three sisters are brought together not by divorce, but by the fact that Harriet Andersson's character is dying, painfully, of cancer. We discover the characters inner lives through flashbacks and dreams, while on the surface we watch their dysfunctional inability to comfort one another when it's most needed. 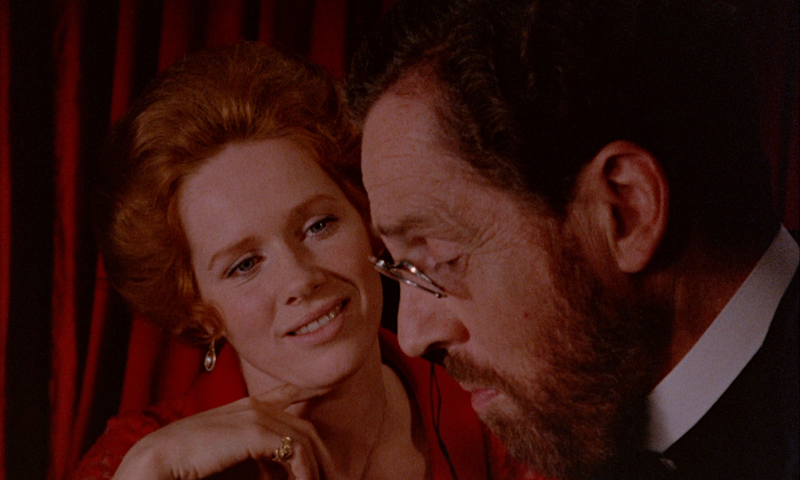 There's an incredible red motif created by Bergman and Sven Nykvist, but as bold and distinct as it is, nothing can distract you from the film's powerful drama. The three leads: Andersson, Ingrid Thulin and Liv Ullmann, as well as impressive supporting actors Kari Sylwan and Erland Josephson, captivate and pull you through this dark meditation on death and and how we spend our time leading up to it. Criterion debuted Cries and Whispers on DVD in 2001, upgrading from their 1999 laserdisc. Tartan issued a barebones version for the UK in 2002 as part of their large Bergman Collection - a series I find infinitely more valuable for the lesser known Bergman titles that don't have grander DVD counterparts. 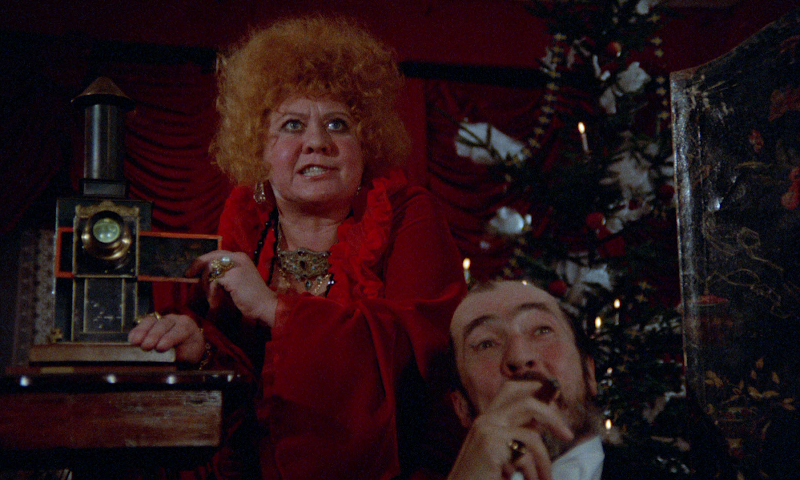 And then, in 2015, Criterion returned to the title for its HD debut on blu-ray. But they're still not done making new transfer of this film, it seems, because today, their brand new Ingmar Bergman's Cinema collection includes a brand new version for 2018. Yeah, it's a whole new scan, let's see how it looks. 1) 2001 Criterion DVD; 2) 2015 Criterion blu; 3) 2018 Criterion blu. Okay, of all the upgrades Criterion's 2018 boxed set gave us, I think this is the best. Because that first blu was a, shall we say, questionable. Criterion gave this film a fresh 2k scan in 2015 and the first thing you'll notice are how much more vivid the colors were. The pillar-boxed 1.66:1 framing is similar, but slightly different between the two versions. The old DVD also had some interlacing issues, which you can see in the first comparison, that the blu has happily corrected. There's a little more detail to be discovered - look closely at Harriet's eyes - but even as far back as the DVD, we seemed to be very "down to the grain" already. Now, I do appreciate that this film is meant to be stylized, and the stronger colors go hand in hand with that. Of course there's meant to be an awful lot of red in this film. But looking at the skin tones, especially in the second comparison, I can't help but think that the color correction but the pedal to the floor in 2015. There are other adjustments with the new blu - the framing has shifted again - but the important distinction is the return to the much more natural look, which I assume is correct. Like, yes, there's meant to be a lot of objects, walls, etc that are very purposefully colored red in this film, but I'm not sure that means the people should look quite so orange. I'd say the good outweighed the bad in 2015, and the non-interlaced HD boost was worth upgrading for; but I think it's just now in 2018 that they really got it right. The lossless Swedish audio, was a nice improvement in either case, and sounds basically the same on both blus. And all three releases also offer an English dub track, which is interesting, in addition to the English subtitles. Of course, Criterion also comes through with some new extras. Perhaps the most compelling extra, though, was already available on the original release: an hour long Swedish television special, the title of which kind of explains it all: Ingmar Bergman: Reflections on Life, Death, and Love with Erland Josephson. But that's all the DVD had. The 2015 blu-ray has a bunch more. First it has another one of those great little Ingmar Bergman introductions that Criterion recorded for almost all of his films and have been including on the majority of their releases since. It's great to have some words from the man himself on what we're about to see. 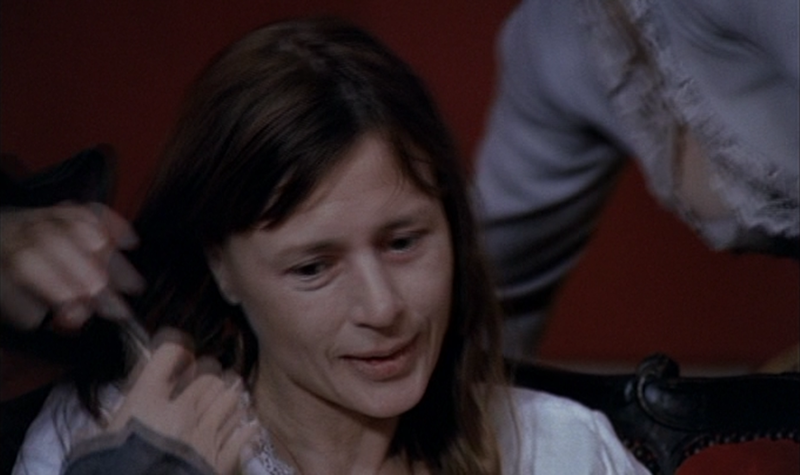 Up next is a 20 minute interview with Harriet Andersson. 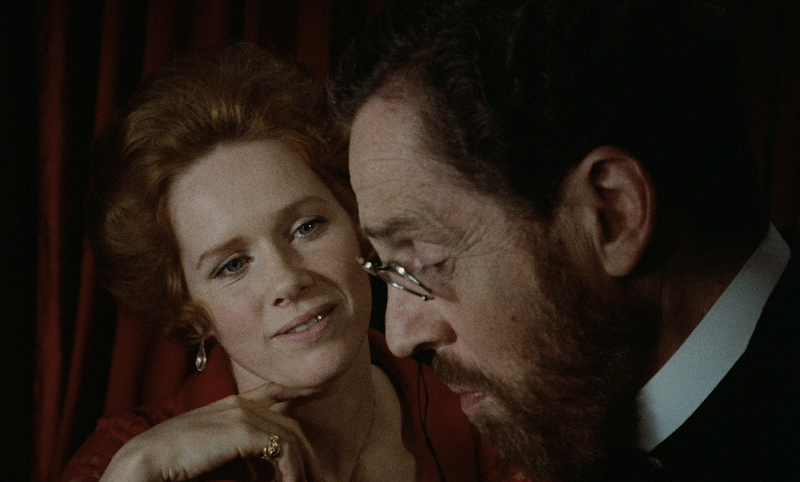 I feel like we hear from Liv Ulmann so much on all Bergman special editions, but this film was really Andersson's show, so I'm glad to see the spotlight shift this time around. 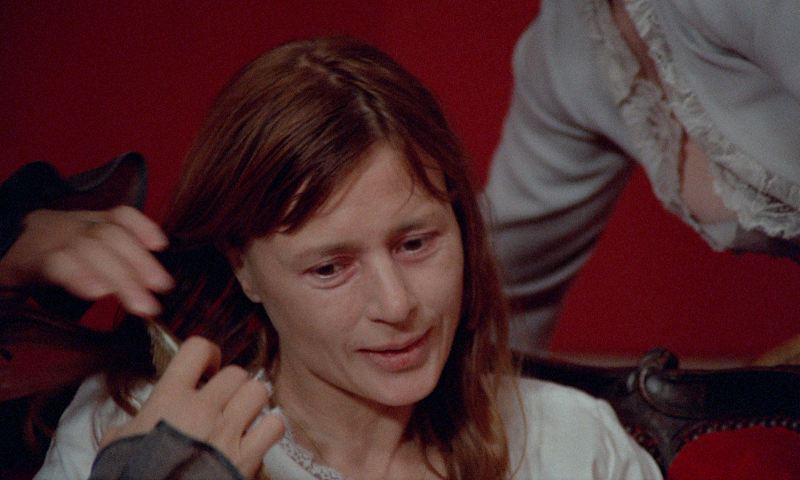 There's also a great 30+ minute collection of behind the scenes footage narrated by Criterion's resident Bergman expert, Peter Cowie, who does his usual excellent job. Then there's a video essay by : : kogonada, which is decent but spends a lot of its time stating the obvious, and I don't know... feels a little arch. Or maybe I'm just letting the fact that he spells his name with a pair of colons bias me. Either way, it's okay for a quick watch but nothing special. And finally, there's a theatrical trailer, which was surprisingly absent from the original DVD, and a booklet with notes by Emma Wilson. The new 2018 blu has the exact same extras package as the 2015 blu besides, of course, for the fact that it comes packaged with all the other Bergman films, and the extras associated with those. 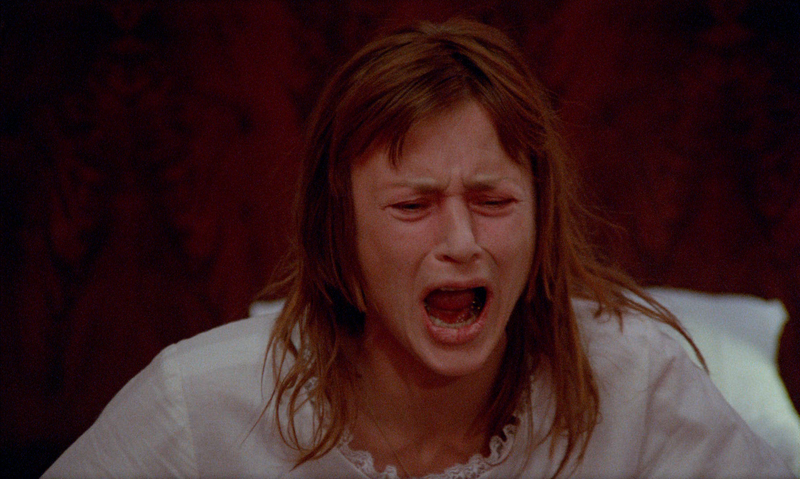 The set includes a bonus disc with several docs and features about Bergman in general, after all, but there's nothing else Cries and Whispers-specific. The Wilson essay from the previous booklets is back again, too, in the box's massive 248 page book. Cries and Whispers is a classic that's just as effective today as it was when it was winning Oscars in the early 70s. They don't all hold up like this one. And so I'm really glad Criterion made the effort to redo their flawed blu-ray and give us a truly definitive edition this time around. Honestly, I'm still working my way through it, but this whole box is awesome.